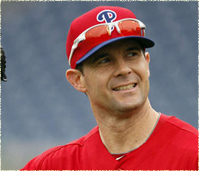 Michael Young is getting a fresh start in Philadelphia. After being forced to change positions from shortstop to third base, then eventually into the designated hitter role with the Texas Rangers, Young was acquired by the Phillies during the winter to be their starting third baseman. However, the 36-year old veteran infielder will have to prove that he can still produce at the hot corner in 2013. Young has not played regularly at third base since 2010, but being acquired by the Phillies to play at just one position is a factor that Young believes will help him get back to everyday form. "I think that my time at third will actually be easier because I can just devote all my time to my reps at third," Young said in his introductory press conference back in mid-December. "The toughest part about playing different spots is dividing your reps, taking 25 percent of your ground balls at third because you have to go to short, second and first." "Now I have all my time devoted to one spot," Young added. "So, I'm looking forward to that, looking forward to getting down to Clearwater, just getting a lot of reps under my belt and just cutting it loose from there." Before being traded to Philadelphia, the Rangers were the only team Young has ever played for throughout his 13-year career. From 2001 to 2003, Young started 404 games at second base before being moved over to shortstop in 2004 to allow Alfonso Soriano, who the Rangers acquired in the blockbuster deal that sent Alex Rodriguez to the New York Yankees, to play at second. Young started 768 games at short across five seasons, until Elvis Andrus became the starting shortstop in 2009, pushing Young over to third base. Third base was Young's shortest tenured position compared to his previous ones. Young only played the 2009 and 2010 season as the starting third baseman, and then the Rangers went out and signed Adrian Beltre, who took over at third in 2011. In what would end up being his last two seasons with the Rangers organization, Young served primarily as the team's designated hitter. Young was in the lineup as the designated hitter for 69 games in 2011, and 71 in 2012. Although he did get some starts at all the infield positions, including first base, it was evident that the depth of the Rangers' roster would not allow him to have an everyday position in the infield anymore. On top of that, Young had a rough season at the plate in 2012. A career .301 hitter in 1823 games, Young hit .277, with 67 RBI's and a career-low eight home-runs last season. This happening just one year removed from a season where he hit for .338, with 11 home-runs and 106 RBI's en route to the Rangers' second consecutive World Series appearance. For Young, the trade to Philadelphia is a great situation for him. He has been given the opportunity to be an everyday player again, and is in a comfortable setting to help him bounce back from a disappointing 2012 campaign. "I couldn't be more excited to be a member of this organization right now," Young said in his press conference. "I have always had a ton of respect, not only for the success they have had, but for their fan base, for their ownership group, but just the non-stop commitment it seems to acquire a ton of talent here." "I've played against the Phillies twice in interleague play," Young said. "I really enjoyed my time. I played here in 2011, faced [Roy Halladay], faced [Cliff Lee]. So I know firsthand who I'm going to be playing behind." "I'm really excited,” Young added. “I'm excited about the opportunity here. I'm looking forward to having a lot of fun, win a lot of games and playing as hard as I possibly can." Phillies general manager Ruben Amaro Jr. is also excited about having Young on the team, not only because Young addressed the hole the Phillies had at third base during the offseason, but also because of the type of player he is. "Bringing Michael to Philadelphia was important to us in a variety of ways," Amaro said during Young's press conference. "One, he fills the need at third base clearly." "But I think more importantly, he brings the kind of character, he brings the type of championship attitude that we are looking for in a player and the people we try to acquire here," Amaro added. "In a lot of ways he fits the bill for us." When Young finally arrived in Clearwater, Florida for Spring Training, he discussed the bar he set for himself with the media. “I'm going to play as hard as I can for him every single night."